Well, DC fans can take a collective sigh of relief. Wonder Woman has finally arrived and it's a step in the right direction for the DC Universe of movies, after the rather lackluster trilogy of films that came before, which seemed to get progressively worse with each release: the so-so Man of Steel, the disappointing Batman v Superman, and the barely watchable Suicide Squad. But despite the outcry of joy you heard this past weekend from critics and fans alike, Wonder Woman is just "good", as opposed to great or terrific. Other than the fact that it focuses on a female heroine, it doesn't really break any new ground when it comes to superhero movies; in fact, it falls into the same traps and clichés that so many movies in this genre have fallen into before. The movie is told as one long flashback, as it begins with modern-day Diana Prince (Gal Gadot) in Paris (she works at the Louvre) getting a package from Bruce Wayne (who doesn't appear in the movie, in case you're wondering). The item he delivers (which fans of these movies will recognize) results in Diana thinking about her past, starting with her as a little girl growing up on the all-female island of Themyscira, where all she wants is to become a warrior like so many other women (pretty much all of them) who live there. Diana's aunt, Antiope (Robin Wright), wants to train her, but Diana's mother, Queen Hippolyta (Connie Nielsen), does not want that path for her daughter. Viewers (and young Diana) get to hear the story of how people were created by the god Zeus, but then corrupted by his son, Ares, who was defeated by Zeus but may still be out there somewhere ready to return. Antiope winds up training Diana in secret and when Hippolyta finds out, she finally agrees with her sister to train Diana, insisting that she teach her to be the strongest warrior she is capable of being. Years later, a now-grown Diana sees a plane crash into the water not far from the island. She dives into the ocean to save the pilot, who reveals himself to be Steve Trevor (Chris Pine). Not long after Steve gets there, the island is attacked by German soldiers, killing many of the female warriors there, including Antiope. Although Steve has helped Diana and the others during the attack, they don't trust him, and use the famous "lasso of truth" on him to get him to reveal he's actually a spy for British Intelligence during World War I (referred here, of course, as just "The Great War" or "The War to End All Wars"). He was flying the plane after stealing a notebook from the notorious "Dr. Poison" (Elena Anaya), who is working with the German General Ludendorff (Danny Huston) to develop chemical gasses capable of killing thousands at a time. Diana and Steve make a deal where he promises to help her find Ares (whom Diana believes is behind all the evil in the world) if she'll get him off the island and back to London. After that long prologue, it's when Diana first arrives in the world of men that the fun in Wonder Woman really begins. The movie's tone switches to a much more playful one, as Diana is essentially a "fish out of water" experiencing things for the first time and with more than a dose of commentary on how women were treated by their male counterparts in the early 1900s. 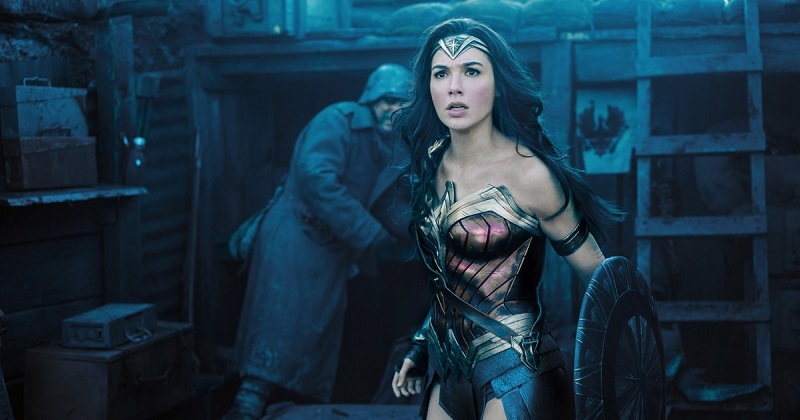 Although told to stay put by his superiors, Steve and Diana (along with a few of Steve's friends they pick up along the way) head off to the war front, where viewers finally get to see Wonder Woman in full costume fighting for the first time, as she advances the Allied troops on the ground and saves a village from German oppression. Without spoiling too much more of the movie for those who haven't seen it, it's the third act of Wonder Woman that is the weakest - with our hero finally squaring off against both Ludendorff and Ares (whose identity I won't reveal, but is way too obvious) in a prolonged action sequence. It's the showdown with Ares that is the worst this film has to offer, as it's just another one of those all-powerful bad guys screaming about how great evil is while blowing up stuff around him. This movie deserved more than this for its climax. It's also pretty annoying that, for all the time this movie has its main character preaching about how she wants to save mankind from its killing ways, Wonder Woman wins all of her battles in this film through fisticuffs and magical powers rather than her wit or intellect. It's a shame the screenplay felt the need to go that way, but sadly huge scenes of destruction have become the standard for DC Universe films (and, to be fair, most Marvel movies as well). But even with the issues I had with the movie, fans won't feel cheated with Wonder Woman. Huge chunks of it (especially the middle segment) are quite entertaining, and while this may not prove to be the billion-dollar hit DC/Warner Bros. was hoping for (it's $100 million opening is promising, but still the lowest opening of the four DC Universe movies to date), at the very least it helps straighten out the ship for the upcoming Justice League movie in November. Order "Wonder Woman (2017)" now!